A yummy, warm meal-in-a-bowl and the prep doesn’t get any simpler than this! 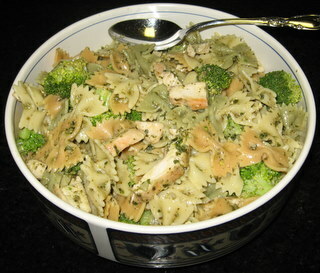 Fold broccoli, pasta and chicken together in a large bowl (or just prepare it in the pot you boiled the pasta in). Gently fold in the pesto, a tablespoon or two at a time, until all of the pasta is lightly coated in the pesto. Serve and enjoy. This is great cold for leftovers, too, or for packed lunches to take to school. Sprinkle with a little freshly grated parmesan cheese, if desired. A sprinkle of toasted pine nuts would be good, too, if your family is game. from the letters in Ketel One Vodka? Cool ad, since I’m enough of a geek to actually try it, although anyone language-geeky enough to actually do the puzzle is language-geeky enough to be seriously skeeved out by the lack of appropriate punctuation in the ad. I must confess that Hubby actually gave me “delete”. Hubby is even more of a geek than I am: after watching me work on the puzzle for a couple of days, he decided to write a program (linking to a small dictionary database) than would create words. Version 1.0 came up with a total of 119 words, but then he linked it to a more comprehensive dictionary (Version 2.0) and was able to come up with 300+ words. After seeing “anode”, I remembered “anole” (cute little green lizards), too. They have them in East Texas (where my grandparents, as well as Hubby’s, live), but we just saw some at the Shedd Aquarium in Chicago, so they were fresh in my mind. I wish there were some “prize” for this puzzle; it seems like I should AT LEAST get a bottle of the stuff. It’s been a while since I had a nice cocktail. 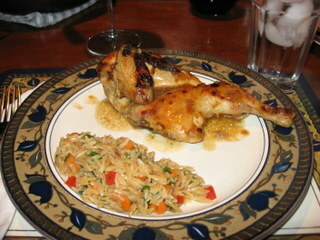 This Cornish Hen recipe from October 2002 Cooking Light magazine is a favorite. I think the glaze would be good on boneless, skinless chicken thighs or breasts, too, but I haven’t tried it. 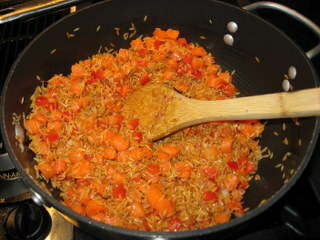 The orzo recipe comes from my best friend’s hubby, who makes it regularly for their family. I added the red bell pepper, which isn’t in his original recipe, mostly just because I had some on hand. 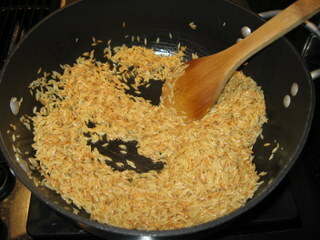 Saute the orzo in the butter and olive oil over medium-high heat, stirring and tossing constantly, until lightly golden brown and toasted. Lower heat to medium. Add garlic, onion and carrots and cook for a few minutes, stirring constantly, until onion is translucent and carrots have softened slightly. Add red bell pepper and cook for about 2 more minutes. Turn heat to medium-low and gently stir in the chicken stock, about 1/4 cup at a time, until pasta is al dente. This could take 2 minutes or 10, depending upon how hot your pan is, how large your orzo is, etc, so the best way to determine if the pasta is done is to taste it (using a clean spoon each time you taste). When the pasta is getting very close to done, gently stir in the spinach and another splash of chicken stock. Finish cooking until spinach is wilted and pasta tastes right. Remove from heat and stir in the cheese. You can add a little freshly ground pepper or a dash of your favorite all-purpose seasoning or herb, if you’d like a little more flavor. It’s not absolutely necessary, but if you’re feeling it needs a little more “kick”, go right ahead. I just talked to a friend whose daughter was one of the guests at Girl’s birthday party last week and she said “I think you really went over the top with that party.” Guilty as charged (although, truthfully, this one of our more “low-key” parties). I LIKE “over the top” – that’s where I LIVE. For Boy’s 2nd birthday, I made a donation to the volunteer fire department so that they would stop by during his “firetruck” themed party. For Girl’s 3rd birthday, we had just moved to Virginia from Texas and didn’t know anyone there yet, so we went back to Texas for a visiIt and had the party with her friends (and our families) there. We no longer had a home (a.k.a. “party venue”) in Texas, so we rented out the Austin Children’s Museum for a couple of hours. That was a BIG hit. Girl wanted a “Lion King” themed party, but Lion King 2 had just come out. I scoured party stores all over town to find the Simba/Nala (Lion King) plates/napkins/cups/decoration and NOT the Kiala/Kovu (Lion King 2) ones. For Girl’s 8th, we had a “Nancy Drew” themed party with a custom-created “mystery/scavenger hunt” for guests to solve. I even bought a tiny little trenchcoat, fedora and magnifying glass and dressed each girl up for a souvenir photo. Ditto for Boy’s 7th: a pirate theme, with dress-up souvenir photos (complete with shoulder-riding parrot). Hubby has artistic tendencies and hand-drew a beautiful treasure map on parchment to lead the kids to the goody bags. 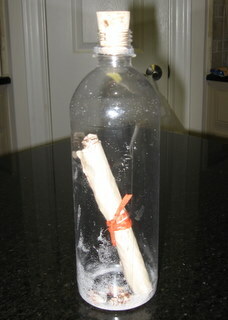 Look at the invites in the photo below: hand-drawn treasure map invites, rolled and tied with raffia, stuffed into empty water bottles (labels removed) with a little sprinkle of sand and mini seashells, topped with a cork. The kids had to remove the maps from the bottle to be able to read the invitation (hand-delivered, of course). For Girl’s 9th, we had an “American Girl” party with one craft from each of the 8 (at that time) American Girls, including churning butter, making thumbprint cookies, fabric dolls, and so on. There were about 20 girls, so I had an elaborate rotation schedule, with adult “helpers” at each station, to ensure that each girl got an opportunity to make each craft. For her 6th, we had a “bug” party and released live butterflies and ladybugs (that we had been incubating at home for weeks) in the backyard. For Boy’s 8th, we had a Harry Potter party. We sorted the kids (with a Sorting Hat!) as they entered and set up a Quidditch game (hula hoops mounted on tall PVC pipes) in the backyard. For his 7th, we had a “Ninja Turtle” party and I decorated the entire 1st floor of our house to look like a sewer and made “slime” (or is it “ooze” – I can’t remember – whatever the stuff was that turned them into mutants in the first place) and let 18 boys build their own pizzas in the kitchen. I think I drank a whole bottle of wine myself after THAT party. For his 5th (or maybe 4th? ), his gift was a ride-on, multi-car train. We built the party around it, giving each kid a ticket to ride at an assigned time. There were kids assigned to be safety monitors, with orange vests. Each kid went home with a small “Thomas the Tank Engine” car, a small train whistle and a little striped conductor’s cap. One dad left us a message the next morning, thanking us (sarcastically) for the train whistle and blowing it into our machine for 5 minutes, explaining that was all that he had been hearing since his son brought the whistle home. 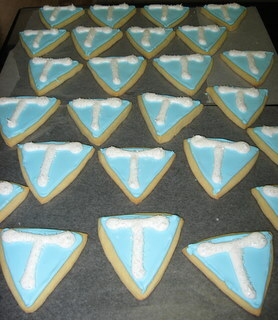 When we left Virginia and moved back to Texas, we had an “I’m so Blue” party for Girl and her friends – get it? “I’m so Blue” that we’re moving? We had blue EVERYTHING: Kool-Aid, blue-iced cupcakes, a nail-painting station with 10 different colors (all blue), blue crafts, blue decorations, blue T-shirts….the works. We don’t just do kid’s parties, either. I had a Sopranos season premiere party once, too: Carmela’s Baked Ziti, Janice’s Biscuits Regina (sesame marzipan cookies), Arnie’s Arancini rice balls, Tiramisu, Cannoli, lots of really good Barolo. I come by all of this honestly. My parents have a joint birthday party every year for my dad and his best friend. They do all of the cooking and bartending themselves. They used to require the guests to come prepared with skits (until the guests revolted). Once they bought food-grade clay for a dinner party and baked fish in it (kinda like this). You prepare the fish with seasoning, wrap it (grape leaves? banana leaves? I can’t remember) and then fold the clay around it and sculpt it into a fish shape (complete with little scale-looking indentations, eyes…the whole bag of tricks) and then you bake it. When the fish is ready, you pull the (now-baked hard) clay fish out of the oven and break it to eat your fish. So, you see, this is in my BLOOD. My nickname amongst my nearest-and-dearest girlfriends in Virginia? Shouldn’t be too hard to figure out….although I’ve never been to prison and I don’t wear shawls. So, I hope that I’ve now cemented my reputation as a permanent dweller of “Over-the-Top-ville”. I hope that you’ll come visit me sometime. We’ll have a great time…..that’s an order. This recipe is from the special July 27, 2007 “High School Musical 2” edition of People magazine. I made them for Girl’s 12th Birthday Party (in lieu of cupcakes). Supposedly, one of the characters (Zeke) makes eclairs for another (Sharpay) in the movie, but we weren’t able to spot that scene when we watched the show. If you’ve seen it, please clue me in. I’d hate to think that I made these things for no reason. They were yummy and relatively easy, but they’re not what I would have considered “birthday fare” if it weren’t for the fact that they were supposed to be in the movie. I made a double batch. The number that a batch makes depends upon how big you pipe the dough, but I found that it makes about 30. Preheat oven to 400 degrees. In a saucepan, bring water and butter to a boil, stirring constantly until butter melts. Reduce heat to low; add the flour and salt. Stir vigorously with a wooden spoon until mixture leaves sides of pan and forms a smooth ball. Remove from heat; add eggs one at a time, beating well after each addition until batter becomes smooth. Use a pastry tube with a No. 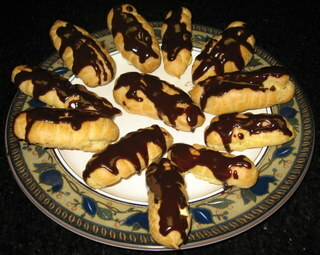 10 or larger tip to squeeze out finger-size eclairs onto baking sheet (I lined mine with parchment paper), well-spaced. (I recommend making them larger than finger-sized to make them easier to fill later – about 3-4″ long and 3/4″ wide). Bake at 400 degrees for 35-40 minutes or until VERY puffed and golden. (If they don’t cook long enough to fully puff, they won’t be hollow inside and won’t have a good cavity for filling later – make sure they’re REALLY puffed up). Cool on a wire rack. In a mixing bowl, beat pudding mix and milk. In a separate mixing bowl, whip the cream, sugar and vanilla extract until soft peaks form. Fold the whipped cream into the pudding. Melt chocolate with water in a small pot over a low flame. Once melted, add butter, whisking constantly. Remove from heat. 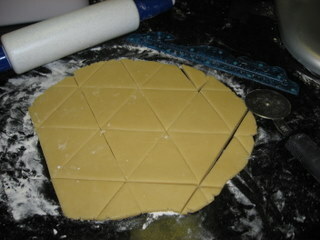 Slice a hole in the pastry large enough to accommodate the nozzle of your pastry bag (#5 or #6 tip). 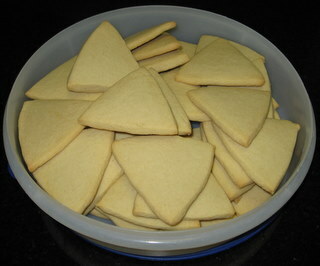 Fill the bag with pudding filling and squeeze desired amount into each pastry. (I poked two small holes in each eclair: on the sides, near each end, and just piped some filling into each one – to be sure that I got full filling coverage throughout the eclair). (Serve any leftover filling as pudding later.) Spread a thin layer of chocolate icing on each eclair using a spatula (I just chose to drizzle mine). 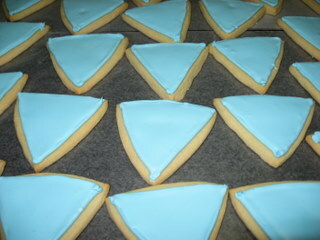 Decorate with additional icing if desired. Wait until icing hardens a bit to serve. Chill in refrigerator if desired. (I’ve frozen the leftover ones and will pop one into the kids’ lunches occasionally as a special treat).